Despite the fact that these all appear similar upon superficial examination, and based on my recent experience with the GEM 1912 family I decided to do a close examination of the various Valets in my possession right at the start. There are minor differences in the handles, nothing to write home about. They are fully knurled with useable cut knurling, no wimpy molded knurling here. Some of the handles do have grooves cut the full length of the handle. IMO, these are some of the nicest handles I’ve ever used on a razor. They are 3/8" in diameter and 3" long. The VC1 weighs 60 grams, the rest weigh 65 grams (my scale is accurate to 5 grams). The dimensions of the heads are all the same. When I remove the handles and place the bottom of the head on a flat surface the highest part is 11/16" high. The depth of the head from comb to the rear is 1", and the width of the head is 1 13/16". The heads are where the major differences lie. As the production progressed it appears that the factory was involved in major cost cutting and in designing ways to make their blades and only their blades to fit the razors. Because of that, these Valets require special blades and for some models there is only one modern blade that will fit. Feather makes a SE blade for the Valet, and I know that it fits all of my AutoStrops. The Valets that require this special blade have a punched out blade cover to fit the punched out Valet or Feather blades. These models are VC2, VC3, and VC4. The VC1 and earlier can accept a modified modern SE blade as well as the Feather and Valet blades. The modification consists of removing the spine and snapping off each rear corner. It’s no big deal to modify a blade. So the early Valets have all the blade choices of any other SE razor plus the Feather or Valet blades. The younger models can only accept a vintage Valet blade or the modern Feather. It just so happens those are the years Valet was owned by Gillette, what a surprise!. I only get 2 good shaves from a Feather and I’ll use Feathers for this review to keep everything as much the same between razors as possible, so every other shave, I’ll use a fresh blade. One short mention... The AutoStrop is designed to strop the blade. Initially I wasn’t going to do that since I had a bad incident not too long ago, but I think I’ve gotten over my trauma and can try it again. Feathers make the perfect blade to strop since I normally only get 2 shaves per blade. If I get significantly more shaves we’ll know that it works. The Valets that require the specific blades are easily identified by a full blade holder, very little of the blade can be seen with these models. Maybe 1/16" is left showing near the comb. The type that can accept modified blades has a short “half” blade holder and a great deal of the blade remains showing after installation. Pictured, only the VC1 to the left can accept a modified blade. Earlier models can as well. Before a detailed comparison I need to install some blades. The VC1 has a spring loaded blade holder that will accept modified SE blades or Feather SE blades. Of course it’ll also accept vintage Valet blades as well. With this model you begin as with every Valet. The head locking lever is pushed up to unlock the head and blade. Then hold the blade by the left side only and get the blade to “start”under the little turned out flap of the leaf spring of the blade holder. While not grasping the sharp edge (common sense), working only from the left side of the blade, it’s slid into place. It takes much longer to write and read this than it does to accomplish the job. 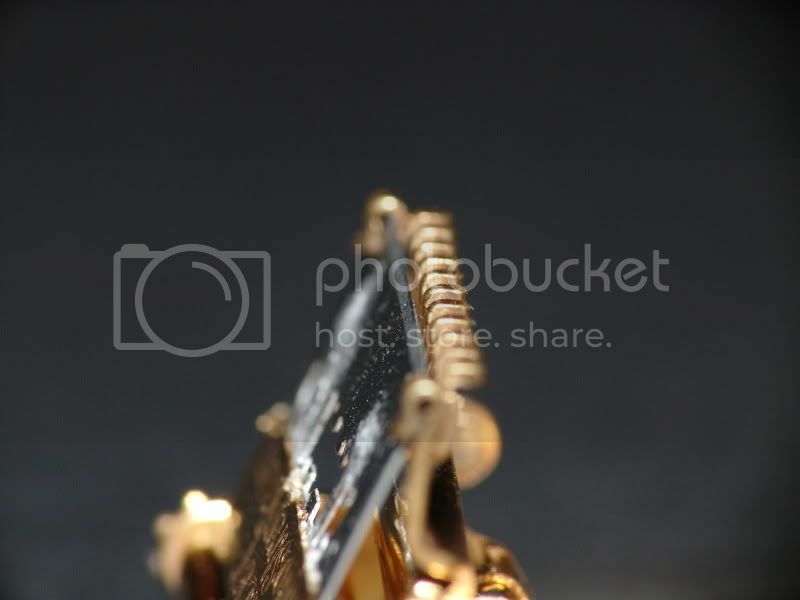 Pushing down on the blade locking lever raises the comb and the blade is held firmly by the clips on the comb. The blade locking lever is between the head and the handle. It also can adjust the aggressiveness of the razor on this model. Notice the turned up edge of the leaf spring that retains the blade. It's to the lower right of the blade holder here. The VC2 begins with the same locking lever, then when it’s unlocked the blade holder is swung open to reveal a door that unlatches from the right side. That is swung open to reveal some punched raised areas that mate with the proper blade (already discussed). I took a Feather and aligned the punched area on the blade with the raised areas. Make sure the blade is installed as close to the pivot point of the razor cover as possible or you’ll be in for a very aggressive shave. The razor will allow that. Also make sure the blade is aligned properly. Complete the installation with the locking lever and make sure that the head locks closed. The VC3 gets opened the same way, so we jump to swinging the blade holder open and find a similar punched area with raised “pins” that mate with the blade. This razor has rounded areas that allow one to properly align the blade . Again, mount the blade as far rearward toward the pivot as possible. This should put the notches in the blade at one extreme and that’s what you want. Again, failure you do this will give a super aggressive shave. This model has little “wings” that keep the blade in place and I manually closed them on the blade, but the wings will automatically cam closed if one doesn’t do that. After that is accomplished lock the head and make sure it’s locked. The raised ares used for visual blade alignment are on the blade holder and inside the wing tabs. The VC4 Blade was installed exactly the same as the VC3 blade was installed. One difference with the VC4 was immediately apparent before even installing the blade. It has a bar comb, the others have open combs. Of course that didn't affect blade installation. It's just an observation. Notes on blade installation. Frankly they leave a lot to be desired. The easiest installation was with the VC1 where the blade just slid in from the side. The other models that require the pins to go into the cutouts on the blade are just nuts. Once in it’s secure and since these blades could be stropped maybe it wasn’t all that big a deal back in the day. But I only get 2 shaves out of a Feather blade, so doing this every other day if these were my everyday razors would be too much. Maybe with experience I’d get faster, but one still has the fingers very close to the ultra sharp edge. The little bit I handled the blade to align it I came very close to seeing blood on 2 occasions. I have no doubt it was designed that way so that Gillette could have a captive audience for their proprietary blades for the Valet razors. It worked, the Valet is no longer in production. Examining the different models closely w/o my glasses (I’m myopic and I can see extremely well up close) there are definite differences with blade exposure. As with the GEM 1912 family there are differences in the relation of the curve of the comb to the blade. The VC3 and 4 both have a greater distance from the comb to the blade. The same models also appear to have more of a blade gap. Maybe these two changes will cancel each other out and yield a similar shave from all four models? We’ll find out. The plan for the shaves is to alternate each blade exposure type to see if I can discern a difference between them. I may also add some additional shaves and alternate between similar models to check those as well. So to sum it up, the older models, the VC1 and VC2 have less gap but the blades are closer to the comb. The newer models, the VC3 and VC4 have blades farther from the comb but more gap. 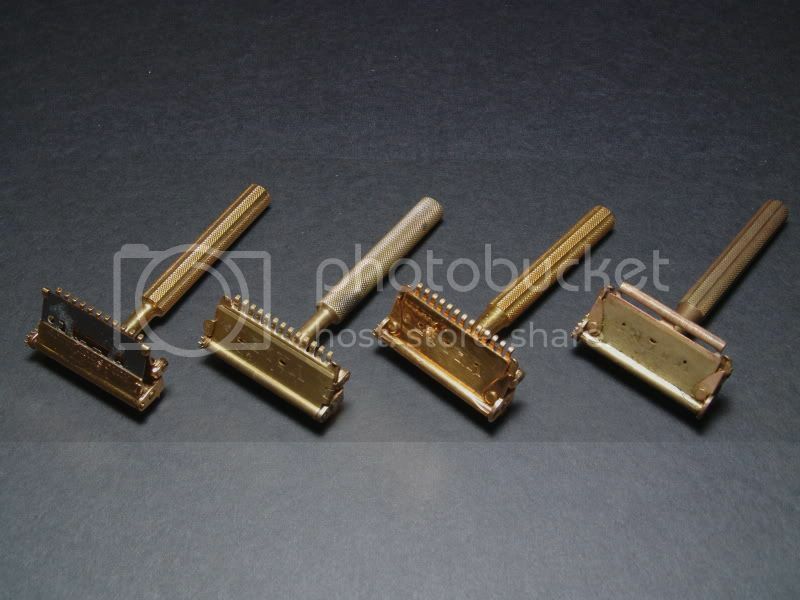 All of the razors have the same Rube Goldberg look to them with tiny gears on the sides. I absolutely love the look. These gears work in conjunction with the rollers seen at the rear of the head for stropping the installed blade. In practice it works great, but that isn’t what this review is about. Just Google “stropping with a Valet Autostrop” or something similar and you should find a few Utube videos to see how it works. The first shave is with the gorgeous VC1. This razor is a medium aggressive razor. Very nice feel to it. It gave a close, 2 pass plus touchups BBS without any problems, hitches or surprises. The angle is typical SE razor angle, a very shallow angle to the skin, almost with the head wiping the skin. The aggressiveness of this razor comes as no surprise, it’s one of the two razors that have the cutting edge close to the curve of the comb. I didn’t strop the blade with the VC1 as the razor is pristine and I didn’t want to wear any of the plated parts. Because of the leaf spring that holds the blade tightly I have no doubt I wouldn’t have run into the problems I did when stropping the blade with the VC4. The VC4 holds the blade with “wings” at the side of the razor and the blade is sort of held in place by the punched out portions of the blade and the corresponding punched areas of the head. I don’t like the way the blade loads one bit, but after spending time with it it isn’t difficult to figure out and get right every time. When stropping the blade, well the operation is rather “sloppy”. 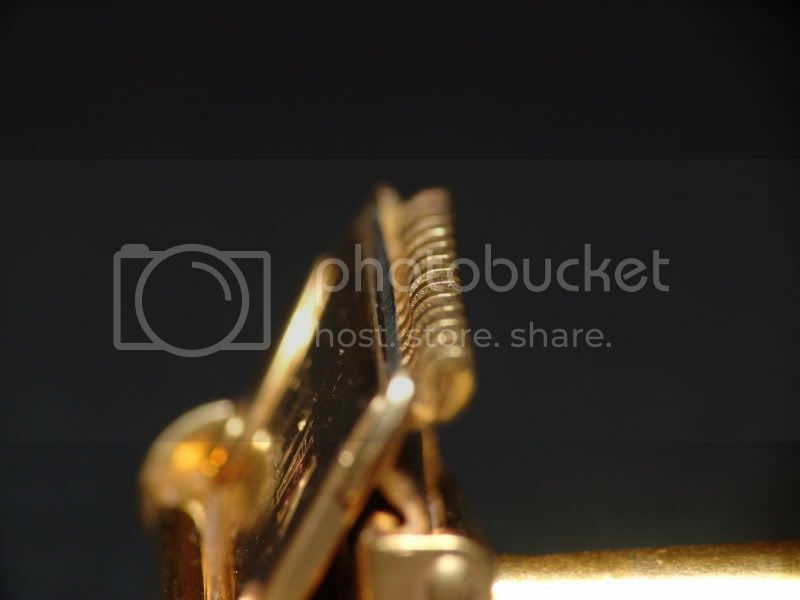 The blade isn’t held snugly by the very nature of the “clamping” mechanism, so after it blade flips even once the blade is out of place in the razor head. That might not be a problem when stropping, but one needs to put it back into place to shave again. I successfully stropped the blade and it’ll be used tomorrow. For the second shave I followed the gorgeous VC1 with the ugly duckling of the bunch, my granddads VC4. Many months ago I tried this razor for the first time and thought it was quite aggressive. I used it again for this review and thought it was too mild. It could be I’ve grown, or maybe the blade wasn’t positioned the same for each shave. But let me change the subject for a moment. I used yesterdays stropped blade and frankly it was the pits. It wasn’t cutting much and I wasn’t looking forward to scraping whiskers off, but wanted to cut them off, so I put in a new blade. Maybe a stropped blade was better or less expensive than a new blade 70 years ago, but a stropped blade certainly isn’t better than a new Feather. Blade loading is the pits in this razor. There is no way to accomplish it w/o handling the cutting edge of the blade, or at the very least, getting extremely close to it. I’m thinking a hairs breadth close, not even 1/16" away from it. But I installed the blade and got a mid aggressive shave, but bordering on mild. I checked the blade stops on the comb and the blade was correctly in place. It might be a 4 setting on a Slim. It’s not an everyday razor for me. Because of the less than optimum blade installation routine I may never use it again. This is my granddads razor and I’d like to use it, but it has too many things going against it. This razor has the blade positioned further from the comb, but with more gap. I mention that only to explain the (for me) too mild shave. This shave would be fine for some folks. OK, so I don’t store the blade in the razor I just used it in. I've got to use another Valet with the same blade for another shave tomorrow. So now was time to remove it from the razor. Opening the head isn’t a problem and the wings slide out of the way easily, but the waxy glue used on the blade makes the blade adhere to the head. I thought the installation of the blade was hairy, removal was even more so. Now I’m trying to use my fingernail to pry the blade up in the only area of the head where I can really see any blade to get leverage on, right near the edge. I do not like this razor. It’s very poorly designed for todays Feather blades. It may have been wonderful for Valet blades, but I’m not using Valet blades. If you have a Valet razor that was handed down to you you might find it worth the hassle, but I don’t. I did manage to pull off all of the blade “operations” w/o blood though. But done many times you’re only kidding yourself if you think it’ll never happen. The 3rd shave was with the VC2 “Million Dollar Razor”. This is another Valet with the blade edge close to the comb, so I’m going to expect a mid aggressive shave like the VC1. Blade insertion is a real PITA with this razor also. The same problems all over again. 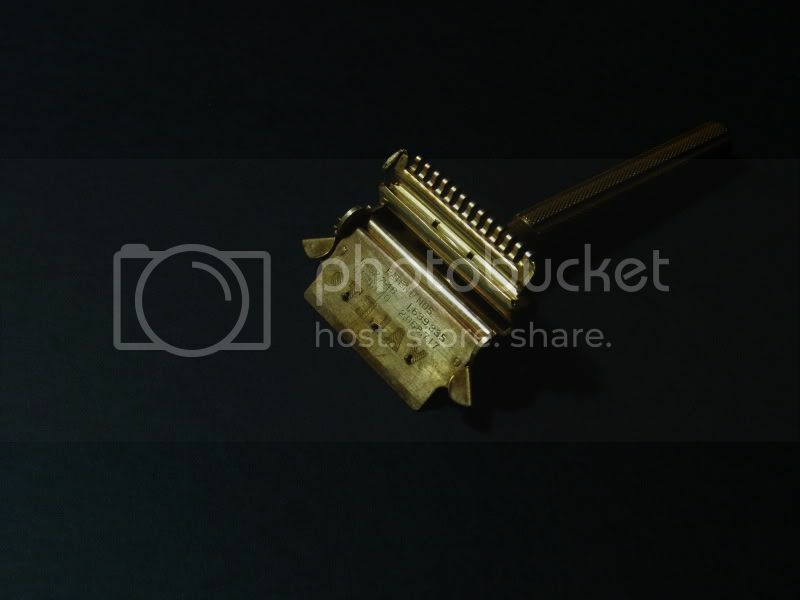 This is the razor that has the same swing open head and then when that’s open it has another door that swings open. There are too many places for the blade to settle in on the pins, and to make matters worse this razor doesn’t have the raised areas to align in the cutouts of the blade to show you that you’re close. Same faults as with the VC4 blade loading, the fingers must work in very close proximity to the cutting edge. But I finally got it in place, and the blade is up against the blade stops. Once the blade is installed properly it gave a great shave, 2 passes plus touchups for a BBS. I prefer a more aggressive razor, but this would do for me. I’m guessing that part of the great shave is the ultra sharp Feather blade. 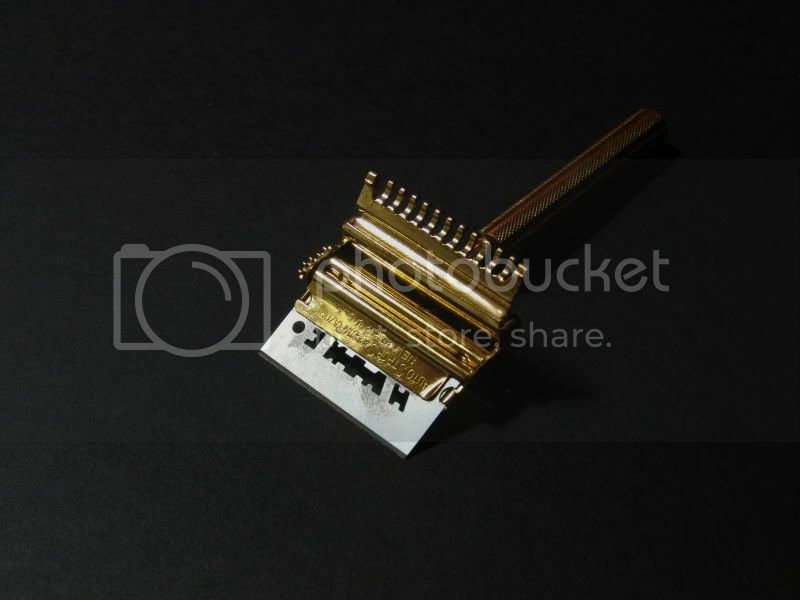 This razor is one of the Valets I have that has the blade close to the curve of the comb. That explains it having a shave I can live with. The next shave will be with the VC3 Autostrop and as is my usual practice I installed the blade in it after using it in the VC2. Of all the “match up the slots with the pins” type Autostrops this design is the easiest for blade loading. It went smooth and fast today. The shave was a bit mild for me, but I expected that. The shave was excellent for the mildness of the razor. It was a BBS in 2 1/3 passes (that equals 2 passes plus touchups). For a Feather blade on it’s 3rd shave, that was some kind of phenominal. Actually the shave was as good as the Valets with the more aggressive geometry. To recap: The looks of these razors for me is better than acceptable. I really like the Rube Goldberg look to the shave head. For me the design flaw for these razors, and particularly the VC2, 3, and 4 is the blade loading. Once the blades are loaded they give acceptable to great shaves, depending on the year in which it was made. The newer ones (VC3 & 4) give a milder shave. The VC1 & 2 gave a mid aggressive shave. Blade loading for the VC1 is the best of the bunch, it’s easy, fast and the hand is away from the sharp edge of the blade. I anticipate my using the VC1 far more than all of the others combined for a few reasons: it has a shave experience I prefer, because of the easier blade loading, and because it will take modified SE blades. As far as stropping a Feather blade... I won’t bother doing that again unless the shavepocalypse is upon us and I absolutely have to. But the real answer for that IMO is to stock up on blades now so that I won’t need to strop blades. Before I close this review, if you have a Valet that takes the modified SE blades (VC1 and earlier) it would be good now to show and explain how to modify a standard SE blade so that it’ll work in the razor. Doing this will allow one to use any SE blade intended for shaving to be used in your Valet. This lowers the cost of using these razors substantially and allows blade options. Sorry, there is no good way to modify a SE blade for the later Valets (VC2,3, and 4) , Gillette saw to that. You start with a standard modern SE spine back blade. What we’ll do, in a nutshell, is remove the spine then snap off the blade corners. Do I need to tell anyone that these blades are very sharp and that extreme care should be used when doing this? If so, consider yourself warned. The first step is to select a blade. Leave the protective paper on it if you have a bulk blade. If not just be very careful. I place the blade on a soft wooden surface in my shop and pry an edge of the spine up with an edged tool. Here I’m using a screwdriver blade. 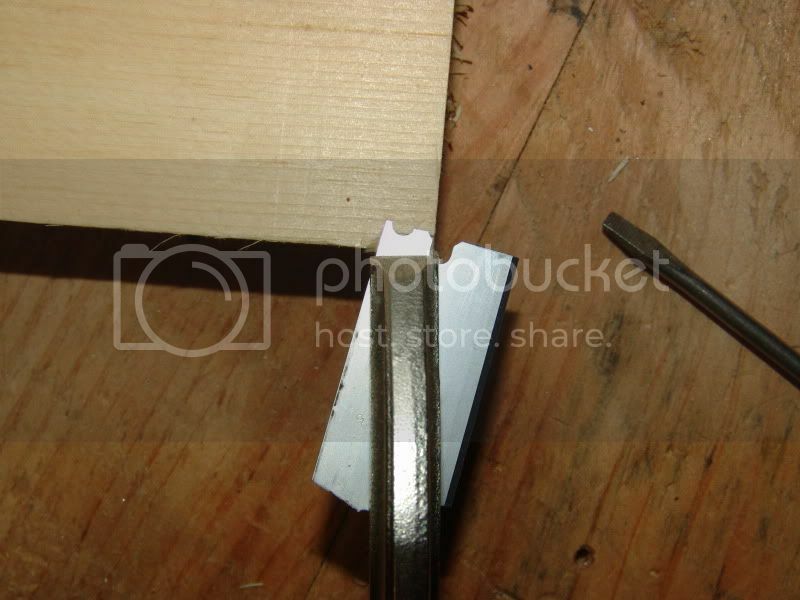 A fine edge on the tool is OK, but it wouldn’t use a sharp edge. The clamp is there to give me something to push against w/o having my hand there in case the screwdriver slips. The amount of edge needed to be pried up is exaggerated here. If you look at the other corner of the spine you’ll see the crimp that needs to be removed from out of the blade itself. Prying up 1/8" just to make sure everything clears the notch it’s crimped into is plenty. Once the corner is pried up hold the blade and using the other hand, just pull the spine off. It’ll come off easily. Use a plier to hold the bare blade if your blade doesn’t have a guard on it. EDIT: There is an easier way to remove the spine from a SE blade. Using a plier, just squeeze the very edge that is folded over to form the spine. It opens right up for removal. Now comes the part that I really don’t like to get my fingers/hands near. Be sure you wear goggles because the piece will fly as it breaks off. I do this out in the shop where the tiny pieces of steel are acceptable. You could also cover the piece with a cloth to contain it, but you’ll give up the advantage of seeing what you’re doing. The paper blade guard needs to be removed to do this part of the operation. Don’t destroy it though, save it for reuse. I use a long jawed Vise-Grip and reach diagonally across the blade with the jaws of the V-G. I place the jaws where it want the blade to fracture, and lock the jaws. 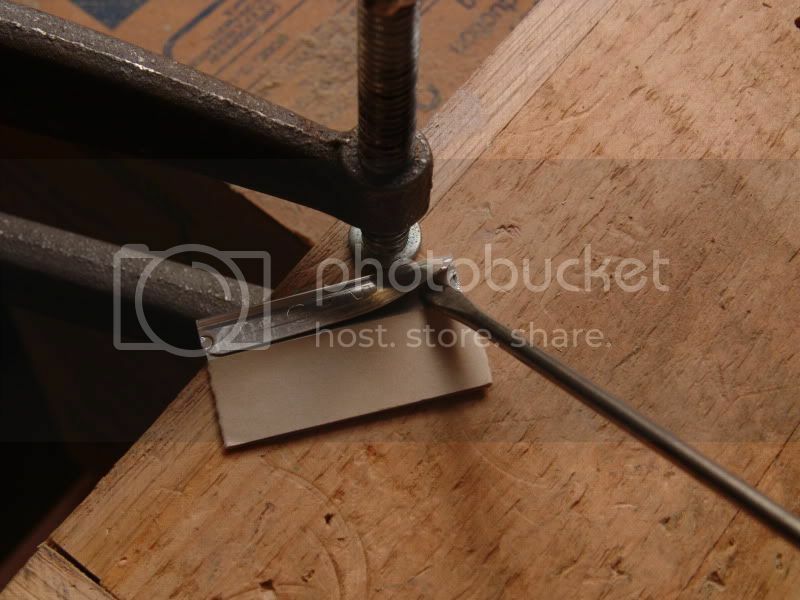 Then using a sharp edged block of wood or metal, and placing the blade/Vise-Grip in the proper relation to the block, a swift tap on the Vise-Grip with a mallet will nicely snap off the corner and leave no bent edge. Done right, this corner is complete, then just repeat for the other corner. The corners can also be bent to snap them off, but this can leave a bent edge and that will just prematurely wear the blade holder out. To do this I use two pliers and placing one in the proper place for the break, use the other to bend the blade. After the blade has been modified I use a piece of tape to reaffix the guard to the blade for storage. 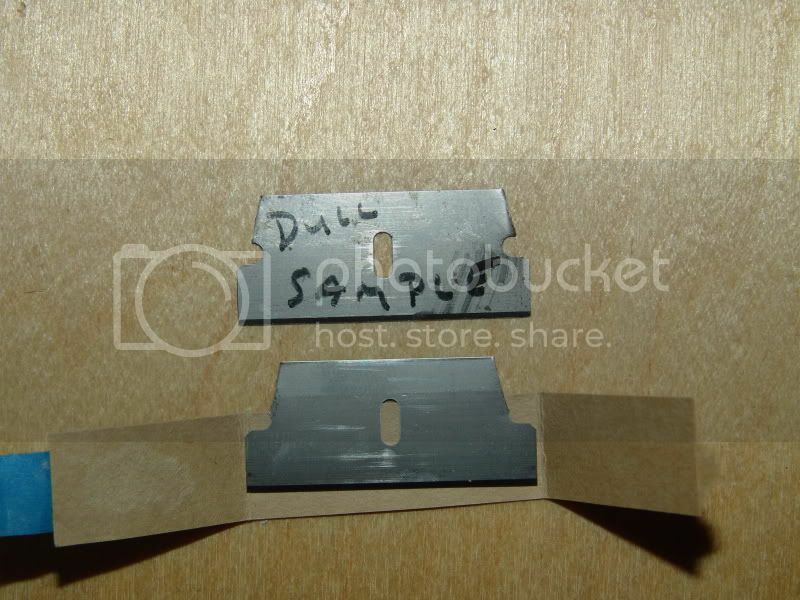 Note the bent right corner of the sample blade. The paper guard is ready to be folded over and taped for storage. The newly modified blade has had more of the corner snapped of than is required, but it'll still work fine. The point is that this isn't rocket science. There is a huge tolerance on modifying blades for use. Last edited by ShadowsDad on Sun Jun 01, 2014 8:42 am, edited 3 times in total. Brian, I've always considered these puzzling razors to be too confusing and complex for me to attempt to even understand them, much less, to get one and try to use it. At the last flea market I attended 2 weeks ago there was one in the box that looked NOS, but the strop was missing. The lady wanted $18 for it. I think it might have been a V1 version. After reading your amazingly informative and well-written article from start to finish, I can only say I am very glad I did not buy that razor, and now I am firmly convinced that these contraptions are far and away much too complicated and labor-intensive for me. Your effort here has been of great value. Thank you! Gary, I should have given prices too. Maybe $18 was an OK price for the one you saw. I paid $30 for my (I can't prove it ) NOS VC1 that is part of a set. Of any of the models, the VC1 or earlier are the ones to have IMO. 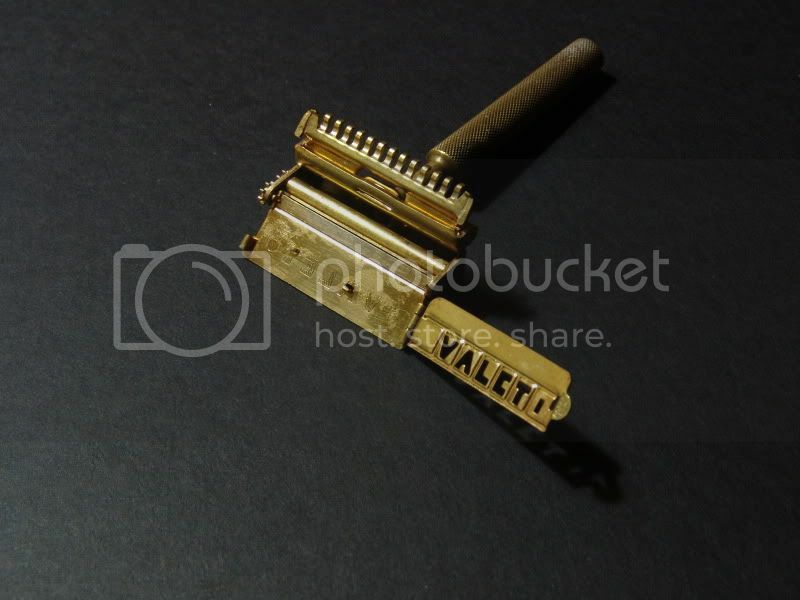 A used Valet, I wouldn't pay more than $10 for one with the strop. Used a lot and showing it, about $6, maybe less. They don't sell for much. 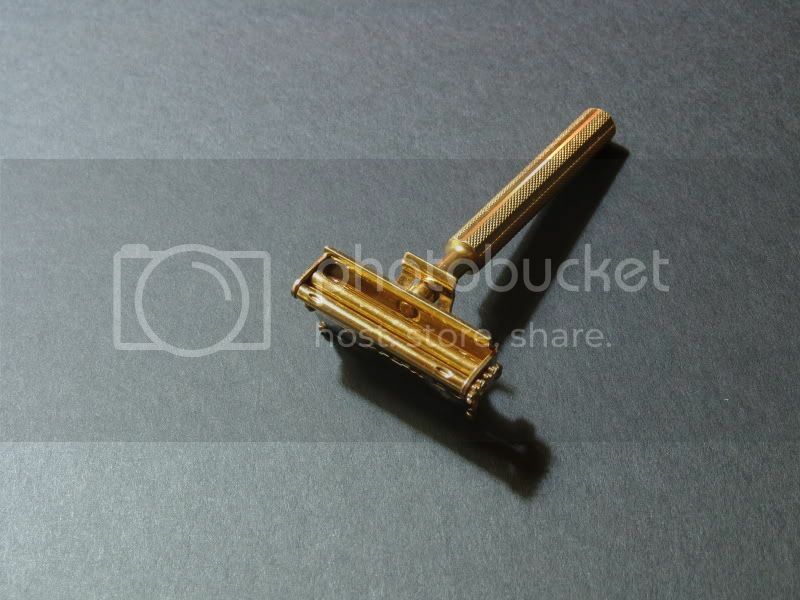 I wish you had an original AutoStrop razor, before the company became Valet AutoStrop. I like the feel of these razors much more. They have the spine like blade holder that accepts a modified GEM blade. However, I often use a normal GEM without modifying as it still fits quite nicely. What I really like about the original AutoStrops are the construction and the weight. Last edited by themba on Wed Jan 25, 2012 7:05 pm, edited 1 time in total. I've used a VC1 and it gave me a great shave. I really enjoyed it, but I didn't feel like having to modify blades for it or pay the premium for the feather ones. Another excellent review Brian and once again an interesting relationship of the edge of the blade and the comb. Thank you very much! Thanks for the thorough review. I have often wondered what the deal was with these razors and this gives me a tone of info. Interesting indeed. An elephant for a dime is only a good deal if you need an elephant and you have a dime. WOW! Brian Thanks so much for that Review. This is Great Info. I feel like I can think about buying knowing whats going on now. Check out the edit I made for spine removal on a SE blade. It's much easier. "EDIT: There is an easier way to remove the spine from a SE blade. Using a plier, just squeeze the very edge that is folded over to form the spine. It opens right up for removal". Yep, did it this way the other night. Works great. Fascinating. I'm not in the market but it's interesting none the less. flintlock wrote: "EDIT: There is an easier way to remove the spine from a SE blade. Using a plier, just squeeze the very edge that is folded over to form the spine. It opens right up for removal". I wish I could take credit for it, but I learned it from someone else. Frankly I don't remember where or who.